I was talking to friend and colleague Neil MacDonald (over on Twitter as xxnapoleonsolo) the other day about dodos. It had been a long, rather difficult week, and I happened to express the opinion that dodos deserved everything they got, as they hadn’t been able to evolve fast enough to overcome changing circumstances.The rather tortured parallel I was drawing was with certain sectors of the newspaper industry; it had been, as I say, a rather dispiriting week. Anyway, Neil (the seasoned blogger behind the truly excellent Scyfi Love blog) came back with much better example of his own. I told him he should blog about it and he did – but since it doesn’t really pertain to science fiction I’m hosting his thoughts here. I NEVER thought I would be looking up to Ronald McDonald as a role model – whether that is because of the ginger curly hair, the fact clowns give me the creeps or the enormous ginger curly hair again. If you remember back in the day, McDonalds was the unchallenged king of the high street fast food market. With an essentially unchanged product since it first came to the country, it was the king of the castle and I – like a lot of kids my age, used to get taken there as a treat. What is more, if you didn’t like it, you could go home. Realistic alternatives were in short supply unless you liked a slightly different type of burger, and any rivals were crushed beneath the sheer scope of Ronnie and his multi-kajillion dollar business. But then … something changed. People started to care much more about the quality of the food they were putting in their bodies as healthy living moved into the mainstream of society in Britain. The treats stopped as more than ever before people were working out, getting in shape, watching the calories and turning their back on fast food which was seen as unhealthy and even dangerous. To a lot of people, McDonalds became the bad guy. So what did they do about it? Hope it would all work out for the best? Pretend nothing had changed as they were still making big money, albeit less than they used to? They changed too, to move with the times and ensure they kept their customers. What is more, they are still evolving. It is a constant process. How? By developing their core product, for instance by highlighting the quality of beef in their burgers, and printing a calorie count on the boxes. They also started to sell new, healthier products or use other meats and vegetarian options, while good quality coffee was suddenly on the menu. 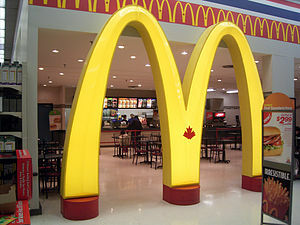 Finally McDonalds changed the experience of visiting their restaurants by massively redesigning them using new designs and furniture and offering other incentives to eat there like free Wi-Fi. So what? So I obviously know waaay too much about McDonalds. Everything they have done can be applied to the news industry to help take advantage of the internet and the opportunities it presents. * Developing the core product – not rejecting it wholesale – to better fit current trends and tastes. * Expanding into new areas which you didn’t even think about before. Some will work, some won’t, but it is worth giving it a go. Changing the whole experience of consuming. The work McDonalds has already done offers a step by step map for any journalist or news organisation to follow. Or we can do nothing except order the heart attack burger with extra fries. Me? The ginger wig is on order and I am wearing incredibly large shoes. Just call me Ronnie. If newspapers are the new McDonalds, does that make subs the burger flippers?